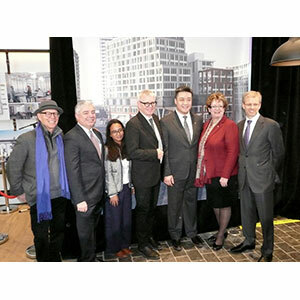 George Brown College and The Daniels Corporation have further cemented their close relationship with the announcement that the school will become part of Daniels Waterfront – City of the Arts. “Academic partnerships have a positive impact and provide tremendous value in this community,” said Daniels vice-president Martin Blake on Monday to announce the public-private partnership at the development taking shape on downtown Toronto’s Queens Quay East. Daniels Waterfront – City of the Arts was announced in March 2015 and, at that time, it was mentioned by the developer that it would explore possibilities for new programs with George Brown. The partnership between the two parties began with Paintbox Catering & Bistro in Toronto’s Daniels Spectrum, a café and catering company staffed by Regent Park residents who received basic training at George Brown’s chef school. It continued with the fashion exchange program, a collaborative fashion hub designed to improve employment opportunities for immigrants and youth in Regent Park, while providing manufacturing expertise to emerging designers and companies. George Brown’s School of Design, including a new Innovation Exchange and a new home for its Institute Without Boundaries, will be an addition to its waterfront campus and be located close to its Daphne Cockwell Centre for Health Sciences and the new student residence, The George, which opened last year. The new 103,000-square-foot George Brown location will employ 650 people during construction and 300 faculty and staff members once it opens in the fall or winter of 2018. Approximately 1,800 students will study there, taking programs including: graphic design; interaction design and development; game development, programming and design; concept art for entertainment; interactive media and design management; and interdisciplinary design strategy. The $59-million facility will receive $15.6 million from the federal government’s Post-Secondary Institutions Strategic Investment Fund. Spadina-Fort York member of Parliament Adam Vaughan credited George Brown’s move to the east waterfront area five years ago with opening up public transit and creating additional interest in the area. Sado anticipates further growth of the waterfront campus after receiving city council approval for the sale of a parcel of land just north of its Daphne Cockwell Centre for Health Sciences as a future George Brown location. “We’re still in the exploration and planning phases, but hope to have more details to share soon,” she said. Meanwhile, Blake said there were record sales at Daniels Waterfront – City of the Arts’ 45-storey Lighthouse Tower and that the 36-storey Lighthouse East Tower will go on sale this spring. When completed, Daniels Waterfront – City of the Arts will include: 650,000 square feet of residential space; 280,000 square feet of office space in two towers; 240,000 square feet of post-secondary academic space; 150,000 square feet of arts and cultural space; and 27,000 square feet of retail. Daniels will also move its head office into the $700-million mixed-use community on the site of the former Kool Haus and Guvernment nightclubs. The site will also feature: Sugar Beach North, an extension of the existing waterfront park with its distinctive pink umbrellas, on the north side of Queens Quay; and another public space called The Yard.